SPOUSES OF U.S. SUPREME COURT JUSTICES & guests: L-R Sue Patterson, President, American Lawyers Alliance, Maureen Scalia, Mary Ann Kennedy, Joann Breyer—and featured speaker Janice Law and Janet Bullinger, luncheon program chair; at Congressional Country Club. 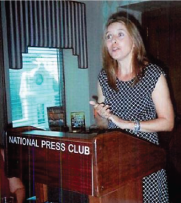 Law spoke about founding American Women Writers National Museum. The annual event is sponsored by National Capital Lawyers Auxiliary. Nota Bene: Click above icon to watch AWWNM’s documentary, filmed at Library of Congress, on rare books by American women writers! 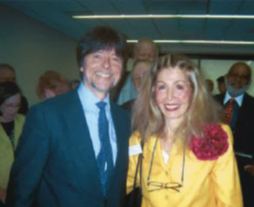 KEN BURNS, Documentary Film Maker Extraordinaire, chats with AWWNM founder Janice Law at the National Press Club, Washington, D.C. Author Law is a member. Both lived in Ann Arbor, Michigan around the same time period. 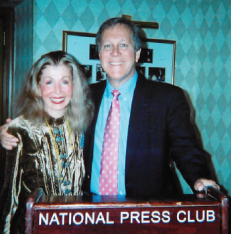 Janice Law, AWWNM Founder, with Dana Gioia, past director, National Endowment for the Arts, who spoke on his new book: Pity the Beautiful. His presentation was sponsored by AWWNM. 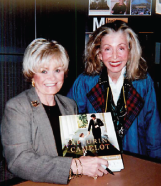 PAULA KERGER, PRESIDENT AND CEO OF THE PUBLIC BROADCASTING SYSTEM with AWWNM founder Janice Law, at the Ken Burns Event at the National Press Club, Washington, D.C. 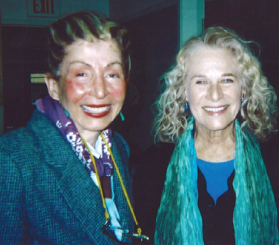 Legendary American woman songwriter Carole King, right, chats with AWWNM Founder Janice Law after King’s appearance on WAMU radio, the NPR affiliate in D.C. Carole King’s new book is A Natural Woman: A Memoir. April 10th: WOMEN BEHIND the CURTAIN: PAY ATTENTION to the WIZARDESSES! CNN filmed AWWNM! See Media Page! Program videos see State Meant Page. Estimates indicate that women purchase 70% of books sold in America. Women drive Broadway shows -- comprising 62% of audiences, and 54% of New York Philharmonic audiences, according to the 3/30/14 NY Times. Clearly, women preserve American culture. Yet, until now, no national venue existed honoring the collective work of America's premier women writers--historical and contemporary. In a writerly continuum from Abigail Adams' (1744-1818) erudite letters to her husband President John Adams (1735-1826)--a riveting eyewitness account of America's political beginnings--to Margaret Munnerlyn Mitchell (1900-1949), Nelle Harper Lee (1926- ) to the popular contemporary novels of Danielle Steel (1947- ), and the activist poetry of Marguerite Ann Johnson (Maya Angelou) (1928-2014) these American women writers, to name just a few--communicate our culture in eloquent voice. To be reminded how eloquent, click on UTube icon on this page, to view AWWNM’s documentary video, filmed on location at Library of Congress, with Americana Curator showing and explaining a sampling of rare books in LOC’s collection by America’s brilliant women writers! American women not only rode covered wagons, birthed babies, cooked, taught children, healed the sick, enjoyed the romances, and confronted the complexity of their era--they wrote about it all with insight and flair. Gifted women sometimes were overshadowed by men writers--not in creativity and skill, but in public visibility and recognition. To feature their talent, The American Women Writers National Museum (AWWNM) opened in Washington, D.C. on February 13, 2012. The intent is to divide material/ programs into journalists, poets, historians, cuisinieres, playwrights, screenwriters, and authors. Interactive displays, rotating exhibits, films, plays, readings, speakers and rental space are planned. The prestigious Center for the Book in the Library of Congress has partnered with AWWNM. 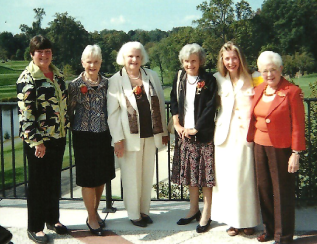 Each month AWWNM honors premier women writers from 4 states. Click on UTube icon on left of this page, to hear readings by gifted women, of the work of other talented women from your state! Print a free state poster on State Meant 4 U! page. "Your Laura Ingalls Wilder speakers were excellent; well-versed in heir respective crafts and well-equipped to answer wide ranging questions. Thank you for planning and producing such a valuable resource for us all." "Words & Music by Note-Worthy Women was a truly memorable AWWNM event, especially giving panelists like me a chance to meet each other, and meet you! May your efforts to establish this museum bear fertile fruit. Thanks for the opportunity to share our (musical) work with others." AWWNM HOSTS LIBRETTISTS & COMPOSERS: Words & Music by Note-Able Women: L-R Frances McKay, Ellen Frankel, AWWNM founder Janice Law, Janet Peachy, Tamara Cashour, at AWWNM panel. Lights! CAMERA! – SRO crowd schmoozes at Screenwriters panel. See MORE Screenwriters photos on AWWNM’s Awesome speakers page. 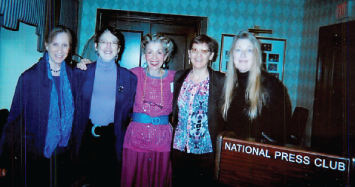 SMILING w/EMILY D : L-R Emily Dickinson Scholar Martha Nell Smith; Janice Law, AWWNM Founder; Dickinson Scholar Nelly Lewis Lambert; and Rosemary Plakas, Curator of Rare Americana at the Library of Congress, at AWWNM event on the American Poet. "As a result of AWWNM's 50-state Project, in which Oklahoma CFB cosponsored a D.C. program, premier women writers across America are garnering attention on a national stage! Keep up the good work Janice! Thank you! ". 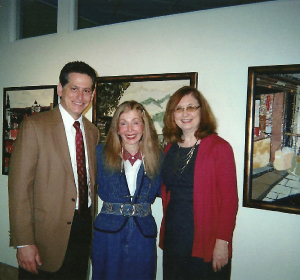 "As a result of your exhaustive efforts, West Virginia women writers received much-needed national recognition. The West Virginia Center for the Book was very proud to work with AWWNM in the 50-state Project! ". "Participating as speaker in an AWWNM event was a great pleasure. I enjoyed speaking with the intelligent and engaging individuals who attended. I am very impressed with AWWNM's broad range of programs and activities". 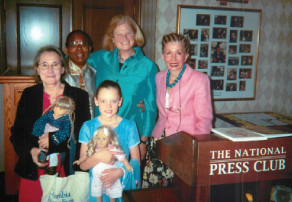 AMERICAN GIRL – Author of American Girl books, Valerie Tripp (in turquoise) with AWWNM founder Janice Law (in pink) with guests and dolls at Oct. 8, 2014 AWWNM presentation. "I often gauge success of Oklahoma events in D.C. if they make you feel you are in Oklahoma again. This was a wonderful success! Your comments were so professional, and the AWWNM program had such depth and professional structure." "I've discovered that American women writers have affected every facet of the literary world, media and general entertainment. I've always been fascinated by literature. But never did I stop to consider how much my everyday life is enriched by the work of these women. Discovering that American women writers are responsible for my favorite television shows, news articles and even nursery rhymes has given me a new-found respect not only for their work, but for their legacy as well". "Thanks for getting me out of the office and into a wonderful (January 29) AWWNM cultural experience.". 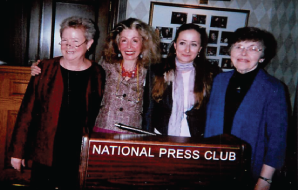 PULITZER WINNER EDNA FERBER’S GRAND NIECE: Playwright Julie Gilbert, (center), holds her biography of her Great Aunt Edna Ferber, about whom Gilbert spoke in an October, 2015 presentation to the American Women Writers National Museum. Her husband Bob is on her right. To her left is Janice Law, AWWNM founder. "I’ve been utterly delighted by AWWNM programs whose presentations, particularly on Emily Dickinson, are so brilliant, stimulating and fascinating. Thank you for including me in your invitations. I congratulate you, Janice, on your panache, persistence and your passion.". 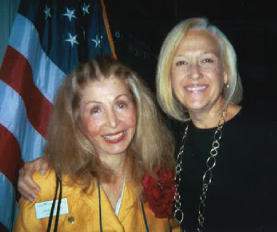 (left) Marilyn Geewax, National Business Editor, National Public Radio, October, 2016 AWWNM Speaker at National Press Club (with Janice Law). 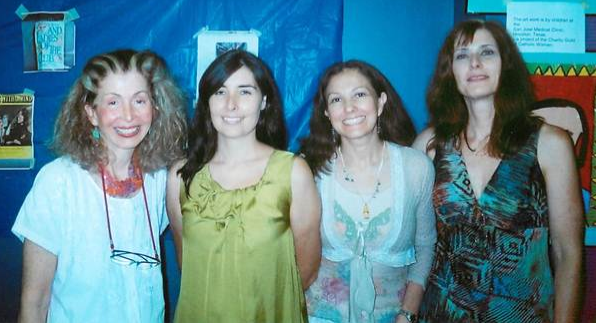 AWWNM Playwrights Panel, Washington, D.C. - L-R: Mary Hall Surface; Jennifer Nelson; Renee Calarco; Janice Law, Founder. Click to hear Stellar playwrights describe their craft; plus reps from playwright groups. HONORING NORA: NYTimes best-selling Nora Roberts, left, has authored more than 190 books, which have sold in excess of 400 million copies worldwide! 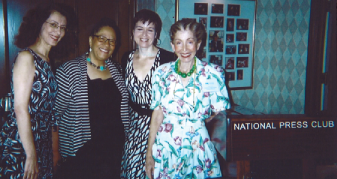 Janice Law, right, visits about American Women Writers National Museum. HAPPY 3rd Anniversary AWWNM! 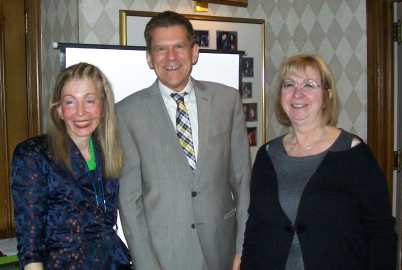 L-R Janice Law, founder; Christopher Reich of IMLS, and Patricia Krider of First Ladies Museum at February 4, 2015 celebration. LAW AS FEATURED AUTHOR- Jeff Marcus, 1st Asst. 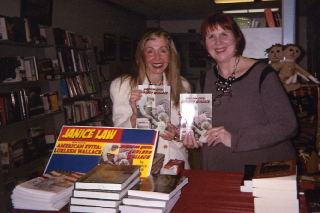 Stte Atty, Janice Law, former ASA, and Dorothy Klein, director, Broward County Florida Library Foundation at a Jan 12, 2016 BLF event. Janice Law with AWWNM Board of Directors member Helen Hester Ossa at Nora Roberts 2015 event. 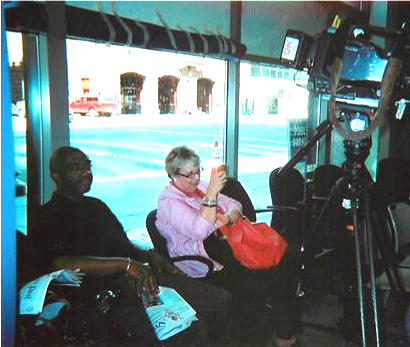 CNN FILMS AWWNM: Val Willingham, CNN Producer, (right), works with CNN cameraman filming AWWNM panel program. See more photos on Media: CNN WP NYT page. For a listing of women who've won a Pulitzer Prize, click here. 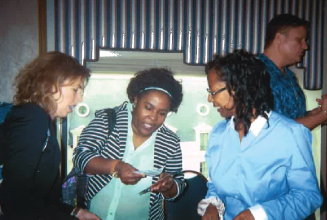 The American Women Writers National Museum launched the 50-state Project in May, 2012. 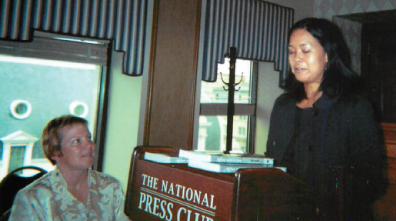 AWWNM invites representatives of each of the 50 states, plus territories, to spend a portion of an assigned week in D.C. hosting tributes to premier women writers from their state. See photos of co-sponsored programs to date on State Meant 4 U and Events & Calendar pages.